The Craft Council of BC is holding a fundraiser called “Celebrate Craft…Beer!” on November 5th between 7:30pm and 10pm. 18 Local BC breweries will be pouring beer during this fundariser to support the ongoing delivery of the Craft Council of BC’s Craft, Heritage & Me program. There will be a silent auction to raise funds with lots of goodies to bid on. “Celebrate Craft … Beer!” is a charitable fundraiser celebrating the seasonal craft beer of 18 BC breweries, alongside a curated market of local artists. The funds raised will support the ongoing delivery of the Craft Council of BC’s ‘Craft, Heritage & Me’ program for under-served youth. Craft brewers will be submitting their unique seasonal craft beer for an evening of tasting by judges and craft community enthusiasts. Jurors – Rebecca Whyman, Chad McCarthy & Ken Beattie – will select the winning beer. And the prize for the best in seasonal category will win an amazing handmade tap designed and created by a noted local craft artist. This charitable event will be held 7:30pm November 5th @ Performance Works on Granville Island and will include live music by ‘Not You’ – an electronic duo composed of Sanford and Future Ghost, munchies, a blind silent auction of BC experiences and a curated craft market for you to peruse while enjoying the selection of seasonal craft beer! You will get the chance to bid in the silent auction for prizes such as ‘Beer for a Year’, Brewery Tours & Tasting with Red Truck Beer, an Edible Canada gift basket full of local delicious goodies, dance lessons with Joe Ink Dance, generous gift certificates to Burgoo Bistro & The Latest Scoop amongst many other amazing local experiences! For a full list of silent auction items click here. Join local artists and artisans at the craft market and find that perfect gift in time for the festive season: Bev Ellis, Julian Duerksen, Joanna Lovett, Olympia Komianos, CraftedVan, Good Mallows, Heather Konschuh, Zed Handmade & Charmian Nimmo! Tickets include 4 tasters of beer & a 4oz tasting glass to take home. Tax receipts issued for a portion of the ticket price. Click here for a list of participating breweries and artists. “We focus on creating characters that cheer you up and always stay where you’ve last left them.” Craftedvan specializes in magnetic bookmarks, magnets, and cards. The all natural marshmallows that are on a mission to bring a whole new level of appreciation to everyone’s favourite squishy sweet. With flavours inspired by everything we love to eat, they are memories and smiles in a single bite. Julian Duerksen is intrigued by the ancient craft of glassblowing which has grown into a modern day art form requiring technical skill, physical stamina, and persistence. He works from his studio in Burnaby, BC, in Canada’s Pacific Northwest, where he creates glass objects and stemware with close attention to artistic and technical detail. He is intrigued by the vibrancy of lushly coloured glass as well as by the clean and simple reflective qualities of clear glass. Internationally recognized Canadian artist, Heather Konschuh is actively making her glass work and instructing at Terminal City Glass Co-op in Vancouver, BC. Her wide portfolio includes flowing forms and vibrantly coloured hand blown and sculptural glass pieces. Zed Handmade is a small independent studio based in South Surrey, Canada. All Zed pieces are designed and hand knit by Diane Zwickel, using 100% Peruvian Highland sheep and alpaca yarn and fair trade Uruguay merino wool. The designs, colour palette and attention to detail reflect a love of texture , organic colours and natural fibres. Accomplished painter, mixed media artist, ceramic sculptor, and jewelry designer, Bev’s artwork is in university, television, corporate and private collections. Bev studied Fine Arts at UCFV, where she took a major interest in painting, printmaking and ceramic sculpture. She continues to take courses and create. With thanks to our media sponsor – The Georgia Straight! I will be at this event and I hope to see lots of familiar faces! Purchase you tickets from the link below! 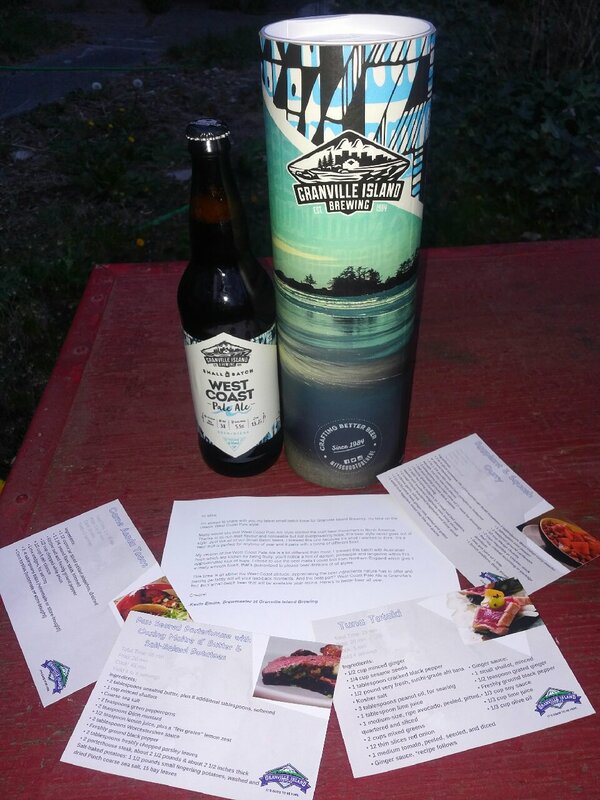 On April 21st, 2016 I was invited to join Granville Island Brewing at their taproom for their Mingle In The Dark event. The event was to both celebrate Earth Day as well as their new initiative to help create green energy. Granville Island Brewing has decided to partner up with Bullfrog Power to help make energy more green in Canada. Bullfrog Power works much like the Carbon Tax in BC where you pay a fee for the power you use and that money goes to creating green energy in the Country. This is even more environmentally friendly in BC where most power already comes from Hydro Electric Dams that area already green. Bullfrog Power will also cover all beer made under the Granville Island brand including both the products made at the facility on Granville Island as well as all other beer produced off site. When we arrived we were greeted with a class of ISA and a card for two free beers and a voucher for a taxi ride home. They also had a spread of snacks to try including meats, cheeses and bread. For the first hour or so of the event the lights were on as can be seen in the following photos. Once the sun started to dip below the horizon though the lights were turned off in a show of their want to conserve energy and be more green and sustainable. It is always good to see that businesses big and small are trying to make a difference with our world. By the end of 2016 all of Granville Island Brewing’s packaged product will display the Bullfrog Power logo. Hopefully more local businesses will step up to the plate and join this green energy revolution. 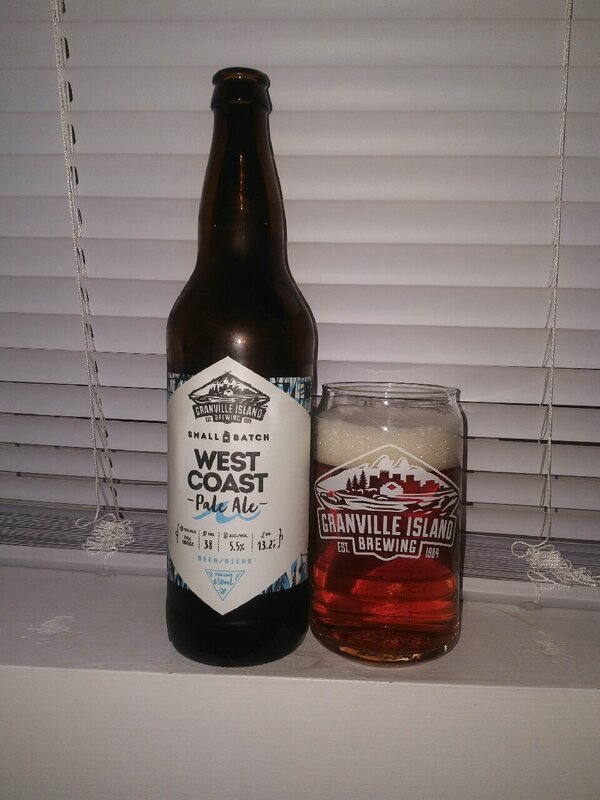 From Granville Island Brewing out of Vancouver comes their new “West Coast Pale Ale”. The beer pours a copper colour with an off white head. The aroma consists of floral hops, melon, citrus and some pine. The flavour is of melon, citrus, caramel, some bread, earth, resin and some leafy bitterness. The alcohol content comes in at 5.5% with an IBU of 38. I quite enjoyed this beer. There is a lot of flavour going on in this bottle. Commercial Description: A malty base topped with light, fruity hops from Australia give this small batch mainstay it’s West Coast personality; outgoing flavour that’s refreshingly laid back. Granville Island Brewing has set out on their inaugural Brew Ski Tour touring BC for great powder and great craft beer. The tour is heading out on the road to check out power around BC and will be partnering with local breweries on the way including Bomber Brewing, Mt Begbie Brewing, Bridge Brewing, Red Collar Brewing and Howe Sound. If you would like to join them on their adventure check out their website to see where they are currently. On February 23, 2016 they held a launch party at Granville Island Brewing to kick off the festivities. Tickets could be reserved online for the party that included two free beer, food, live music and a version of cards against humanity called cards against BrewSki. The brewery dressed their tasting room up a bit like a ski lodge for the event. Thanks for putting on a great party Granville Island Brewing and I hope you have a great rest of your BrewSki Tour! For more information on the BrewSki Tour check out this link.